Our company is offering a wide range of gear cutters, which are manufactured using premium quality steel and are available in various sizes and dimensions which include a range of 0.5 module to 35 module, 50mm to 300mm diameter, 50 DP to 3/4 DP and from 2" to 12" diameter. Material: M-2, M35, T42, ASP 2030 etc. Involute Gear Cutters are supplied from 1.0 module to 40 module & 30 DP to 0.8 DP with maximum diameter of 282 mm. Conforming to BS 2518, IS 5698 from numbers 1 to No.8 tag to cut any number of tooth. Cutters with special profiles as per drawing & specification are also manufactured. We are the leading exporter and manufacturer of Involute Gear Cutter which are available with the pressure angle of 14.5 degree to 20 degree. The price of involute gear cutter is very competitive and affordable. 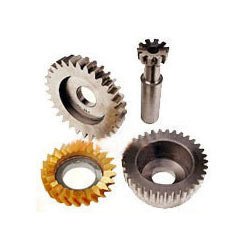 Involute gear cutter is made up of superior quality raw material. Owing to our rich industry experience and the dedication of our team members, we are engaged in offering utmost quality DP Gear Cutters at affordable market prices. Involute Gear Cutters are manufactured by us to cut any number of teeth in gears from module 0.5 to 50 and 64 DP to 0.5 DP with maximum diameter of 360 mm conforming to BS 2518, IS 5698 standards. Special milling cutters along with profile of particular number of teeth are also offered by us as per the convenience of clients. Module, DP and CP series Shaper Cutters are manufactured by STC Spur as well as Helical Shaper Cutters are available in Disc, Hub and Shank Type varieties Material used is generally AISI M35, M42 & ASP 30 Grade and accuracies are as per DIN-1829 Standard Class 'AA' and Class 'A'. single gear cutters - from 0.1to 55 module 120 to 0. 5 DP first specific number of teeth or in a sets of 8 cutters. 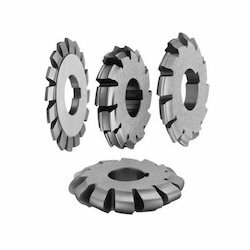 when according single gear cutters, the cutter number or the number of teeth to be cut must be specified.Stepped Up Gear Roughing Cutters are available in Alternating Plain and Serrated form for faster roughing of larger gears.